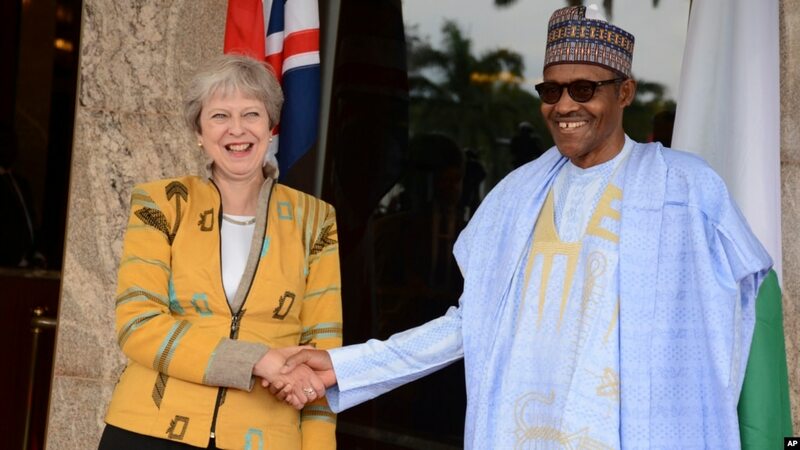 KANO, NIGERIA — British Prime Minister Theresa May got plenty of attention for her trip to Africa last week. Videos of her dancing — one with secondary students who greeted her in South Africa and another with her dancing with young scouts in Kenya — went viral. But May’s dance-floor diplomacy didn’t overshadow her larger mission in Africa, which was to forge business ties for a post-Brexit Britain. In Cape Town, she pledged more than $5 billion to support African markets and also promised that her country would overtake the United States to become the biggest investor in Africa out of the G-7 countries. German Chancellor Angela Merkel made her own recent foray to Africa, visiting Senegal, Nigeria and Ghana, also seeking economic benefit. China has played the role of Africa’s largest trading partner for the past nine consecutive years, and both Britain and Germany have a lot of catching up to do. 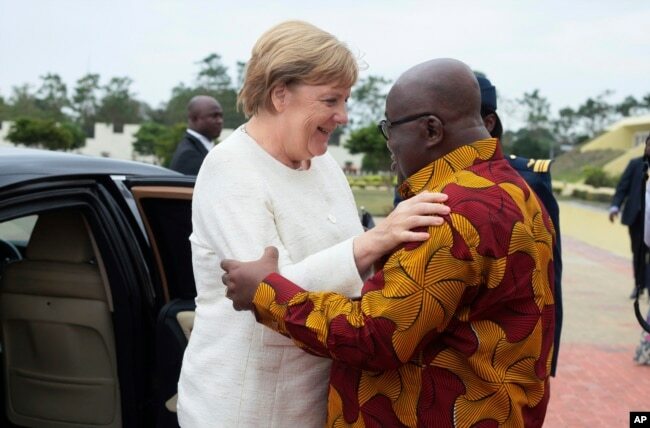 German Chancellor Angela Merkel, left, is welcomed by Ghana’s President, Nana Akufo-Addo, right, at the Presidential palace in Accra, Ghana, Aug 30, 2018. According to British government figures, the country’s total trade with Nigeria, South Africa and Kenya — the countries May visited — amounted to $16.9 billion in 2016. That’s less than 2.5 percent of the $712 billion in goods and services that Britain exchanged with the European Union in the same year, Reuters reported. Meanwhile, Germany declared 2017 a key year for its Africa policy and hosted African presidents in Berlin at a G-20 summit to boost private investment. However, to date, Germany only has about 1,000 companies that are active in Africa. In comparison, China has 10,000 firms in Africa. It has financed more than 3,000 infrastructure projects on the continent, building thousands of kilometers of highways, generating thousands of megawatts of electricity and creating thousands of jobs across the continent. “China is challenging all the Western countries, even the United States. China has no historical background of colonialism [in Africa] so many Africans prefer working with China,” said Bakary Sambe, a development and peace studies analyst in Senegal. This week, several African presidents are in China for the 2018 Forum for Africa-China Cooperation, which China’s Foreign Minister Wang Li described as the biggest summit of all time. But, Nii Akuetteh, a prominent independent Ghanaian policy analyst based in Washington, D.C., recommends African politicians, businesses and civil society members be wary of both the West and the East. “If I had my way, they would be far more vigilant and tougher against Merkel, against May, and even against the Chinese, because all these global powers are rushing to Africa now and they all claim that they love Africa and they want to help. Well, we all heard that before and it led to slavery and it led to colonialism,” he said. Akuetteh said May and Merkel are motivated in part by a desire to stop the waves of African migrants showing up on Europe’s shores. “They are doing this because their populace don’t like Africans. Merkel is very clear, that’s why she’s doing this — we want to create jobs in Africa so you all don’t come to Europe,” he said. Merkel said she wants to work with these governments to tackle issues the three countries are struggling with, such as the Boko Haram insurgency and widespread unemployment. One of the agreement she said was an MOU signed between German automaker Volkswagen and partners in Ghana and Nigeria. Volkswagen announced last week it would assemble cars in Ghana and make Nigeria an automotive hub. Ayisha Osori, the head of the Open Society Initiative for West Africa, commends this effort and says African leaders need to acknowledge the reasons why citizens are risking their lives to flee. “It’s a good deal to create more jobs to keep people away from migrating, coming over to Europe in less numbers. Looking at the people who try to cross the desert, that go by sea or by boat, what are they running away from? What is it about their lives that is making them to take such dangerous journeys?” Osori asks. In this scramble for Africa, the United States looms in the background, contributing mostly military support. The Brookings Institution says U.S.-Africa relations will not reach their potential if the executive office fails to provide diplomatic and policy leadership. But U.S. President Donald Trump has shown little interest in the continent and angered many Africans with offensive remarks. Though Trump has no announced plans of going to Africa, first lady Melania Trump announced in August that she will visit — without the president.